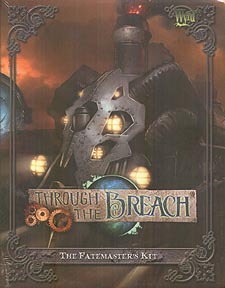 This Fatemaster's Kit contains tools to make running your Through the Breach game easier and more engaging. The Fatemaster's screen has commonly referenced information on the Fatemaster's visible side so that you can easily find the results of dangerous critical hits, or quickly set the difficulty of an encounter. On the reverse, the players can reference a map of Malifaux City, keeping them aware of their current location within the strange world. In addition, this kit contains deluxe character sheets, making character creation, advancement, and reference all the eaisier, and more exciting.